Previous Exam Question Paper of the IBPS Marketing Officer Exam held on 8thFebruary 2014 was given in the link below. Candidates those who are preparing for the IBPS Marketing Officer Exam 2015 can download it and use it to score more marks. 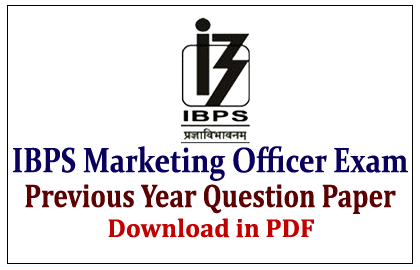 IBPS Marketing Officers Exam 2015-Previous Year Question Papers to download it in PDF click the link given below.